Our stunning caravan is situated on Ladram Bay, it sleeps 6 people (with space for a cot in the master bedroom) and features 2 bedrooms, one double, one twin and there is a double pull out sofa bed in the lounge. 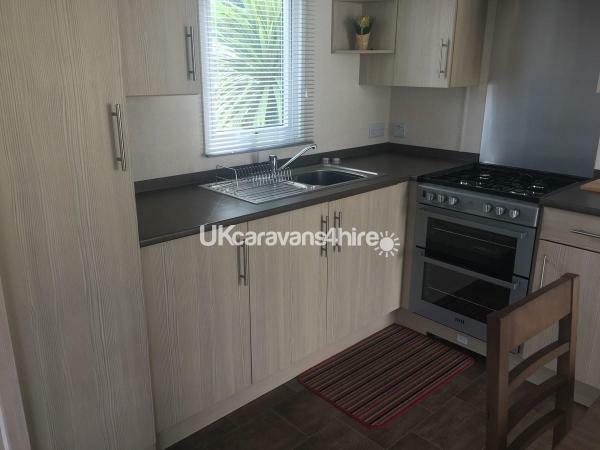 There is a fully equipped kitchen with gas hob, grill and oven, microwave, fridge freezer, kettle, toaster, pots, pans, crockery and utensils. The open plan living area features a 40” TV with Freeview and DVD player. In addition we have added some soft furnishings to help it feel like a home away from home. 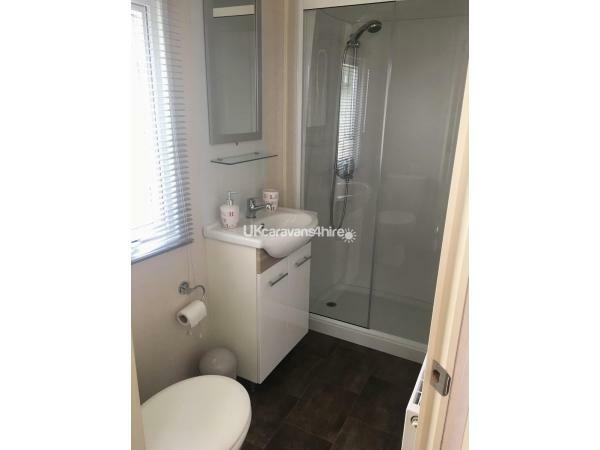 The caravan also benefits from Gas Central Heating and Double Glazing. The bedrooms have lined curtains (handy for those with young children!) A second TV has also been installed in the master bedroom. Externally the caravan benefits from a UPVC veranda with patio furniture. We also benefit from additional privacy to the rear of the van as we are the only van to have rear decking. The decking offers spectacular sea views and is the perfect spot to relax with a drink. There is tarmacked allocated parking for one vehicle adjacent to the caravan. 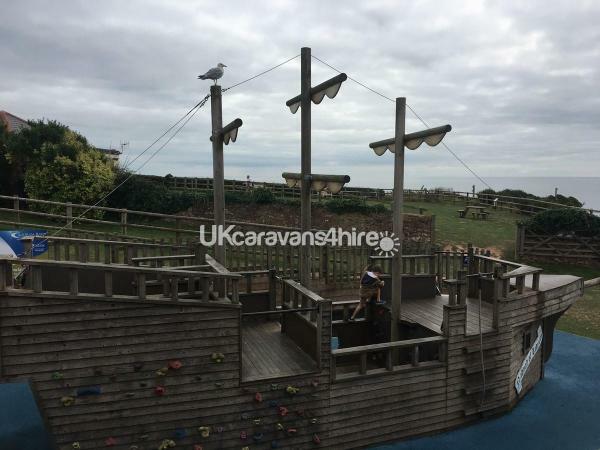 The caravan has extensive sea views as well as views. These really need to be seen to be believed and are spectacular any time of day or night. I cannot get a photo to do them justice! 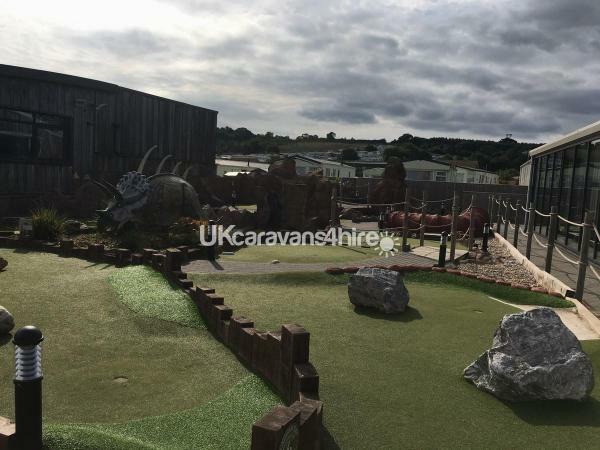 Adventure Golf and much, much more. The park also benefits from its own private pebble beach where you can hire paddle boads, boats and kayaks as well as the beach shack selling essentials and the days freshly caught seafood! The hire price includes, gas, electricity and water usage throughout your stay as well as cleaning on your departure. Swimming Pool passes are not included in the price and these will need to be purchased from the pool desk. Check in is from 3.00pm with check out at 10.00am. Later checkout may be available for a small charge depending on arrivals. The caravan is strictly no smoking and no pets. Booking will be confirmed upon receipt of a non-refundable deposit. The balance and a £50 key and breakages deposit will be required 8 weeks before your stay. Any holidays booked within 8 weeks of arrival will require payment in full at the time of booking.